At a recent OSHER lecture given by The Memory Center in Bennington, Vt., on the subject of memory loss, it was stated that “what’s good for your heart is good for your brain.” The Killington Active Seniors (KAS) are busy taking care of both. 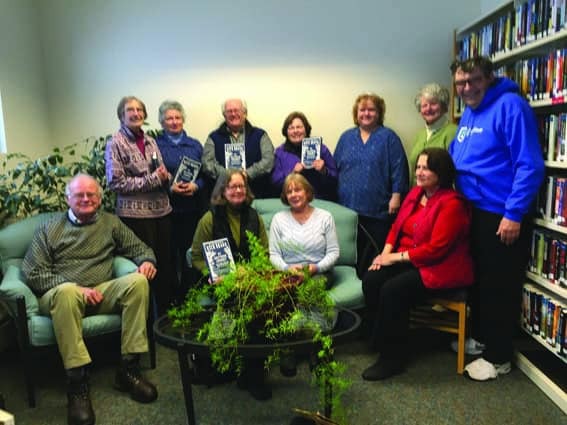 The newly formed book club at Killington’s Sherburne Memorial Library, held the last Wednesday of every month at 1:30 p.m., has just finished reading “My Southern Journey” by Rick Bragg. This is a compilation of many short essays by Mr. Bragg, a Pulitzer Prize winning author. Of course, his beloved South is featured and gives an overview of the food, traditions and family lore that is all important and honored in the Deep South. Another point made in the above mentioned OSHER lecture is that it’s far more mentally stimulating to read a book than see a movie because one has to work at creating the scenes and people talked about in a book rather than someone else creating them for you as in a movie. As you read “My Southern Journey” the description of food will have your mouth watering for a taste and you will long to be sitting on a big front porch with ice tea in hand. The current book selection for the month of March is “The Endurance: Shackleton’s Legendary Antarctic Expedition” by Caroline Alexander. This selection, curiously enough, tied in nicely with another OSHER lecture titled “Walks with Penguins: an Antarctic Adventure,” given by Elaine Parker. She presented a slideshow about life on the highest, driest, coldest, windiest, harshest place on earth. Alexander’s book chronicles the extraordinary journey of Shackleton and the 27 men who accompanied him and their struggle to stay alive in the Antarctic. This particular book is also the choice of the Vermont Humanities Council’s statewide One-Book Community Reading Program. The Killington Active Seniors are certainly not struggling for survival but are struggling to fit everything into busy lives. Between traveling, families and volunteer work they stay pretty busy.